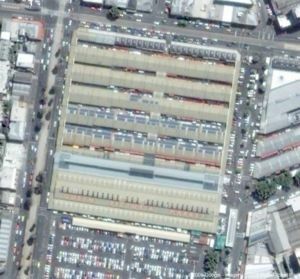 The Queen Victoria Market in Melbourne, Victoria has the largest urban grid-connected solar photovoltaic array in the Southern Hemisphere consisting of 1328 solar panels covering one third of the market roof. The system, launched in April 2003, has the capacity to generate 252,000 kilowatt-hours of electricity each year for the Queen Victoria Market - enough to power around 46 average Australian homes a year. 1328 solar photovoltaic laminates installed. Each laminate measures 1.59 metres by 0.79 metres. The installation took about 2000 man hours to complete. The system generated 239,000 kilowatt-hours of electricity during the 2003-2004 financial year. The installation saved more than 350 tonnes of greenhouse gas emissions for the 2003-2004 financial year alone (based on Australian Greenhouse Office estimations that in Victoria, every kilowatt-hour of electricity generated by clean energy sources - sun, wind and water - abates an equivalent of 1.467 kilograms of greenhouse gases). Current kilowatts of 100 per cent clean electrical power being generated. The corresponding total reduction in greenhouse gas emissions achieved to date. The latest power readings and CO2 savings being generated by the solar power system can be viewed online. These readings are also available on a public display located outside the food court in Queen Street (opposite "B" Shed) at the market. The decision to switch the Queen Victoria Market to solar power offers the City of Melbourne and the community the distinct benefits of significantly reduced energy bills and a dramatic reduction in the volume of greenhouse gases being generated in Melbourne’s inner-city precinct. This project, funded by the Australian Greenhouse Office and the City of Melbourne, was awarded to BP Solar with Origin Energy. This page was last modified 04:39, 10 January 2008.